Barefoot Resveratrol Anti-Aging Tonic: What is Resveratrol & What can it do? What is Resveratrol & What can it do? Resveratrol is a molecule so tiny it penetrates almost any wall of a cell in an organism. It continues into the cell nucleus, to the cells genetic machinery. There resveratrol selectivly switches on genes that aid the survival of an organisum, like the Sirtuin 1 DNA repair gene. Using gene silencing, it switched off genes involved in the initiation and progression of disease, blocking replication of bacteria, viruses, fungi and tumor cells. EXTENDS LIFE --- by infulencing gene functions, resveratrol has been shown to extend the life of yeast cells, fruit flies,roundworms, fish and even over fed labatory mice. New studies show it even slows the onset of virturally all aging diseases: heart, cancers, arthritis and Alzheimers. Other new discoveries shows it does still more... repairs alcohol damaged livers, slows bone loss, boosts endurance, promotes hair growth, and re-energizes cells. Leroy Caeasy, professor of pomology at Cornell discovered resveratrol in 1992. Excitement for this molecule boomed in 1997 when a team lead by Professor John Pezzuto (University of Illnois), reported resveratrol inhibited the onset and progression of cancer in mice like no other molecule. Comparing resveratrol to 19,000 other substances -- he said "Resveratrol is by far the most promising against cancer"
Who discovered Resveratrol's ablility to extend life spans? MIT researchers discovered a gene Sirtin 1 which controls the rate of aging. This gene is switched on by caloric restriction. In 2003 Harvard scientist David Sinclair team discovered trans-resveratrol also switches on resveratrol 1 gene, thus mimiciking calorie restriction. Sinclair was the first to show a living organism, yeast cells,lives far longer when givin resveratrol. He later showed resveratrols ability to promote quality of life. Resveratrol may soon become the most prized molecule on our planet. The wonder ingredient in wine is indeed resveratrol. The current studies performed by researchers have shown great promise for resveratrol treating the diseases of aging. Listed on this site are findings for the potential health benefits in treating heart disease, cancer, diabetes, osteoporosis, obesity, and other diseases. Dr. Joseph Maroon, a neurosurgeon, has written a book entitled "The Longevity Factor, How Resveratrol and Red Wine Activate Genes for a Longer and Healthier Life" that offers a definitive look at recent scientific breakthroughs in the study of resveratrol and how research has shown its ability to stave off a wide variety of age-related diseases. 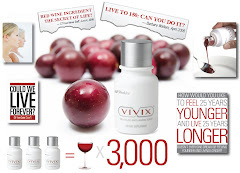 Concerning supplements containing a high quality and potency of resveratrol that is necessary to achieve the dosage levels utilized in the lab tests, there is a new product called Vivix. Shaklee Corporation, the number one natural nutrition company in the U.S. (http://www.shaklee.com/index.shtml), has produced a liquid resveratrol supplement that is 10 times stronger than resveratrol alone due to its patented formulation of polyphenols. Oprah Winfrey and Dr. Oz are both users and promoters of Shaklee products and Oprah has featured Roger Barnett, Chairman and CEO of Shaklee (http://www.shaklee.com/company_lead_ceo.shtml), on her show. The statements made on this blog have not been evaluated by the Food and Drug Administration. These products are not intended to diagnose, treat, cure, or prevent any disease. Rather the statements made are what some folks have experienced personally. Do Certain Foods help fight Cancer? Can Red Wine Help you Live Forever? Cindy McAsey . Barefoot in the Garden . Copyright 2015 . Picture Window theme. Theme images by ozgurdonmaz. Powered by Blogger.